A door doesn't have to be a boring addition to a home… something that merely cordon off rooms and entrances. Doors can create a beautiful home from the minute you step through the entrance. They can be an expression of the home you've always wanted. A home of timeless elegance and charm or something a bit more oriental or rustic. Doors differ from country to country and the materials, style, manufacturing and design are what makes them unique. Interior doors provide intimacy and privacy between rooms, while exterior doors control the security and entry points of a home. The possibilities of doors for your home are endless and we certainly cannot wait to show you just a few of the options available! 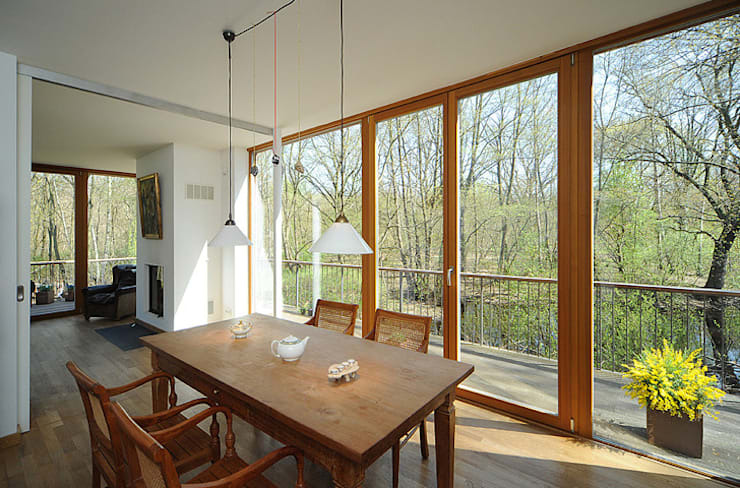 We begin this Ideabook today with a look at this fabulous folding door, it is unique in that it rotates both inward and outward through the use of hinges and can increase or decrease the amount of ventilation or free space coming into the home, by simply opening the panels. 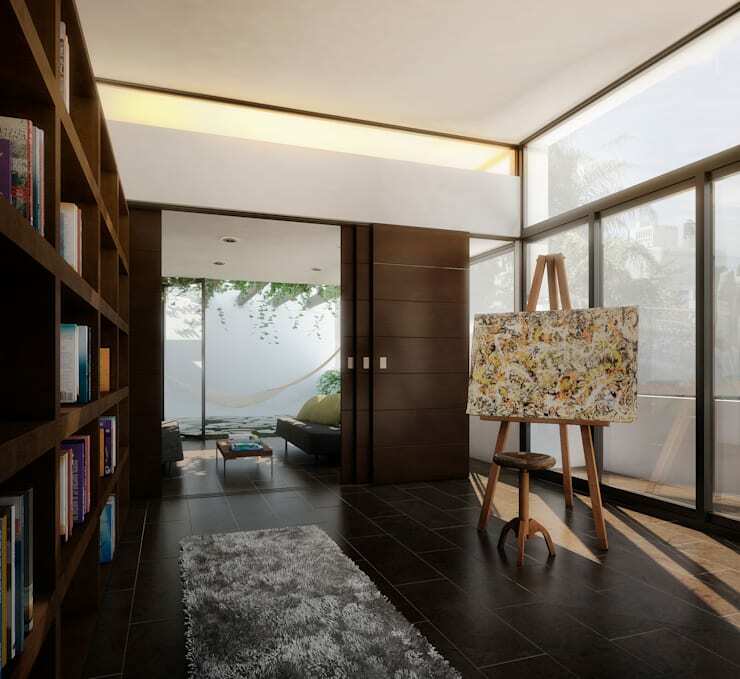 This solid wooden frame with square glass detail creates an attractive home atmosphere that is rustic and elegant. 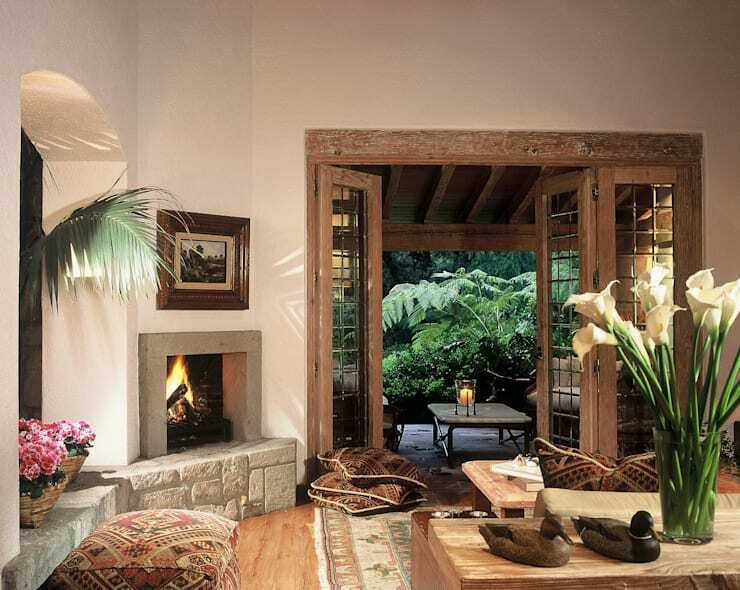 It fits in well with the décor and design of this relaxing living room space and seems to frame the exterior view of the garden in an almost picturesque way. Stunning indeed! The use of sliding doors is a classic decorative partitioning idea used in many modern homes, these doors are easy to open and close and will quickly transform any space… closing the doors for more intimacy or privacy or opening the doors to create endless flow of the room, sliding doors add a touch of elegance to an open plan living space. The doors are easy to fit and seamlessly create an opportunity for a space to look larger through the merging of two rooms into one with minimal effort. What do you think about this stunning dark wood door by Taq Architecture Design? 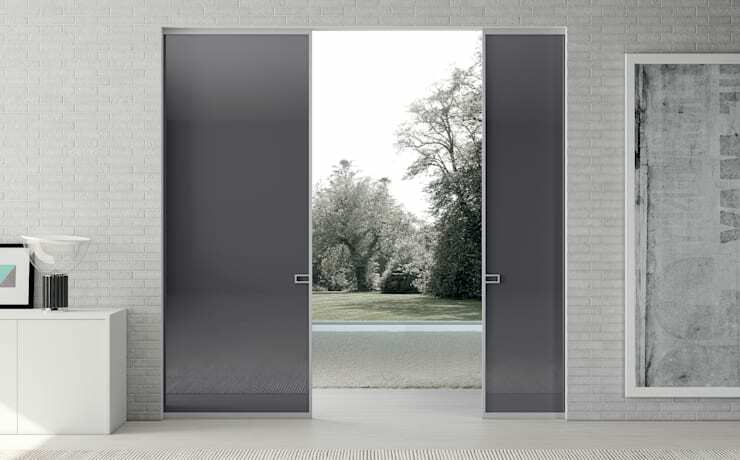 This type of door is also opened and closed in a sliding motion, but it is perfect for rooms where space is rather limited to include a normal oscillating door. This unique door also makes use of a sliding track, but it disappears completely into a compartment in the wall when the door is open. These doors save space and make rooms look larger, however, including this door in your home is relatively more expensive as it needs a lot more work to be fitted. Although, it is considered as one of the 10 favourite doors that architects use in interior home design. The French door, a timeless classic! These types of doors have two glass panels surrounded by frames that are closed and locked in the middle and swing either inward or outward depending on which way the hinges are installed. The doors allow for a great amount of natural sunlight to enter the hallway and creates a spacious and attractive design that is modern, a personal touch may be added through the addition of the classic ironwork. 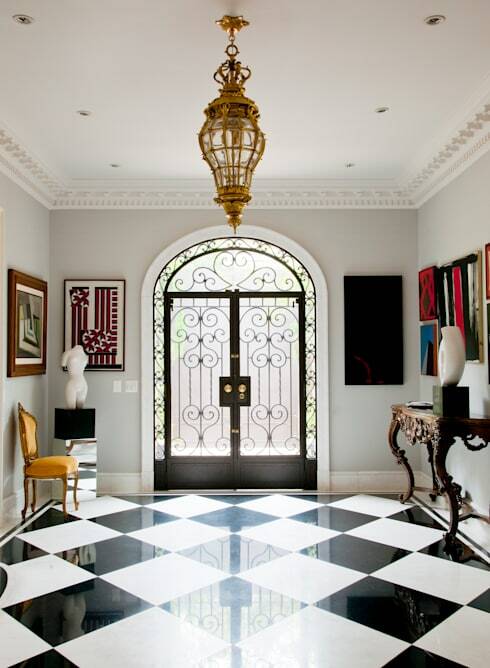 For more hallway inspiration, see how to: Make A Great Impression With Your Entrance Hall. The Dutch door has gained popularity over the years and makes the perfect addition to a kitchen, allowing for natural ventilation of the space while cooking. The top part of this door can open independently from the lower half creating a window-like effect. This type of door is also typically seen in farm houses and has been adopted internationally for its rustic style. The inclusion of the Dutch door allows for farm animals to be kept out of the house, while children can remain inside and out of harm's way. This traditional door is the most popular example throughout the world. For houses with a view, there is nothing better than doors that are top to bottom glazed. Essentially, you get all the benefits of extra windows, but with the added functionality that they can actually be opened up to let the outside in and residents out! 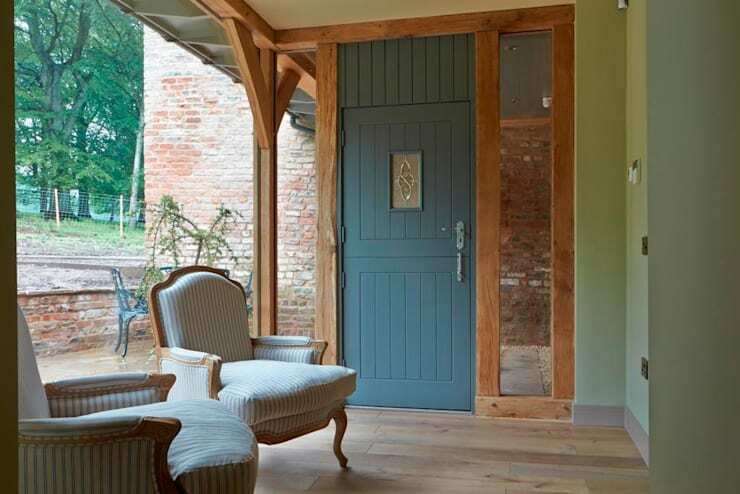 While still offering a barrier against the elements, we just love glazed doors that seek to blur the lines between interior and exterior spaces and think that this example is all you need to convince you that they are for you! Which style of door is your favourite? Where would you place it in your home? We'd love to know!